Appearance: Pours a beautiful golden straw color with bright yellow highlights. A mountainous head slowly settles into rocky peaks of white happy goodness leaving behind a fair bit of lace. Smell: Wow. Tons of floral and citrus (think mango and grapefruit) on this as soon as you crack open the can. Strong grapefruit notes with a distinct pine smell that is indicative of Simcoe hops. This smells like a delicious hop bomb. Initial Taste: Flavor starts out fruity with a mango like sweetness. Some grains are detected as well as a little bit of malt. Bright flavors of pine and citrus begin to dominate the pallet. Apricot and grapefruit flavors rush over your tastebuds preparing you for the piney finish that will leave you thinking you just chewed on a pine cone…in a good way of course! Aftertaste is bitter and quite dry. Thoughts: There is a pretty cool story that goes along with this beer. According to Cigar City they were approached by a brewery in Puerto Rico to give them the opportunity to brew beer at their facility. So apparently they did a test batch at this new (and much much) larger brewery and this was result. A tropical inspired IPA with a Caribbean theme. But that’s not the fun part. The fun part was while they were shipping the beer home to Tampa they decided to dry hop the hell out of it during the ride back with 165lbs of Simcoe hops. And that’s where the name comes from. 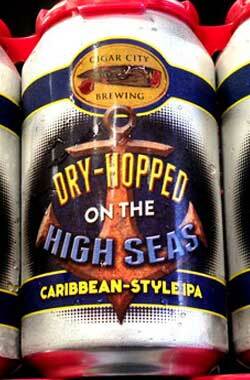 It was literally dry-hopped at sea. The beer itself is very good. It’s reminiscent of their flagship beer – Jai Lai. It’s got that nice grapefruit flavor and smell just like Jai Lai but unlike it’s American brother this one has much more bitterness. The dry-hopping has given this IPA a serious pine hop profile. Both in smell and taste. There are some nice mango and citrus aromas and flavors as well but the piney bitterness is what sets this one apart in my opinion. I highly recommend this to other hop-minded beer drinkers. If pine resin and bitterness are not your cup of tea then I suggest sticking with something a little milder like their Jai Lai. But don’t just take my word for it, go out and try this beer for yourself! Cheers! There is a pretty cool story that goes along with this beer. According to Cigar City they were approached by a brewery in Puerto Rico to give them the opportunity to brew beer at their facility. So apparently they did a test batch at this new (and much much) larger brewery and this was result.